Given Canada’s role as the global leader in mining—home to 75% of the world’s mining companies—and the leading producer of tar sands oil, it should come as no surprise that Canada is seeking to make deeper inroads into the resource rich countries of the Caribbean. However, in contrast to the CARICOM-EU Economic Partnership Agreement, so far there has been little analysis of the potential impact this trade deal will have on the economically vulnerable Caribbean. The primary focus of this lopsided free trade deal is to make it easier for Canadian investment to go into resource-rich countries such as Trinidad, Guyana, Jamaica, Suriname and Haiti—and to protect the rights of Canadian investors. Secondly, the liberalization of trade and investment between Canada and the Caribbean will make it much easier for Canadian firms to takeover the already fragile Caribbean manufacturing and service industries. Currently CARICOM accounts for less than 1% of Canada’s foreign trade, yet Canada is the third most important market for CARICOM-based goods, after the United States and the European Union (primarily the United Kingdom). In 2010, Canada’s largest imports from CARICOM included gold from Guyana, oil and petroleum products from Trinidad, and aluminum oxides from Jamaica and Suriname. With the recent discovery of rare earth metals in Jamaica, the Jamaica Gleaner reported that Canada will be seeking to join Japan in mining this resource which is used for key components in smartphones and other high technology items. The fact that Trinidad is pushing for the talks is due to the fact that they hold a significant amount of tar sands—similar in composition to that found in Alberta. 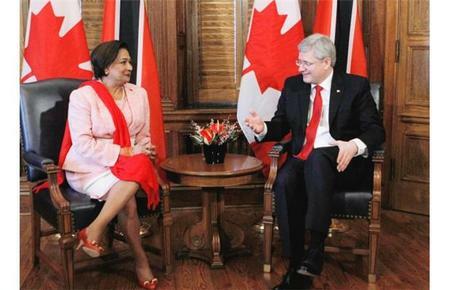 Trinidad is hoping that Canadian investment and technology would help to maintain the island’s oil revenues. In 2009, Trinidad and Tobago Newsday reported that “The extraction of oil from tar-sands involves a greater financial cost and does more harm to the environment than pumping out traditional crude oil, with some reports saying that separating the oil out of the sand generates three times as much of the greenhouse gas, carbon-dioxide, than pumping out conventional oil.” It is estimated that Trinidad holds between 900 million to 2 billion barrels of the tar sand crude oil. Remaining on the issue of natural resources, investigative reports have revealed that currently one-third of Haiti’s Northern Region (approximately 2,500 square kilometers) has been granted as illegal concessions to mining firms based in Canada and the United States. In response to this, the Haitian Senate has called for a halt on all mining activities in the Northern Region. It is important to note that if or when a Canada-CARICOM free trade deal is signed into law, the ability of the Haitian government to halt controversial, exploitative, and destructive mining activities will be severely curtailed. In regard to services, according to the Royal Bank of Canada, Barbados was the third largest destination for Canadian direct investment after the United States and United Kingdom. Over the past decade, Canadians have invested a staggering $390 billion in Barbados. However, this is not an investment in productive capital—but rather Barbados is a leading offshore tax haven for Canada’s largest banks and the extremely wealthy. In addition, Canadian banks (Royal Bank, Scotia Bank, and the Canadian Imperial Bank of Commerce) already dominate the Caribbean banking industry. While the Canadian government has stated that “Canada is committed to negotiating a modern trade agreement with CARICOM that will take into account differing levels of development, vulnerabilities associated with island states, and trade-related capacity challenges”—given the very real power imbalances between the Caribbean and Canada, CARICOM would be wise to look toward Mexico to see how such free trade deals play out. Mexico’s experience implementing free trade stands as a sharp reminder that trade agreements are structured in such a way to benefit the powerful, both between and within nations. Since the introduction of NAFTA in 1994, Mexico has experienced a sharp increase in illegal migration, food insecurity, and informal employment. While foreign capital flooded Mexico, the majority of it did not lead to job creation—but rather to foreign acquisitions of existing Mexican firms. It is telling that the primary service exports of the Caribbean—such as tourism and financial services—do not need a free trade agreement. As such, the CARICOM-Canada free trade deal must receive greater scrutiny within the Caribbean in order to determine whether or not any real gains for the region will emerge from the deal. Given that the majority of Canadian investment is based in resource extraction and financial services, it will predominately serve the interests of Canadian business interests, doing little to alter the dependent nature of the region’s economies. The signing of productive and mutually beneficial trade agreements is one thing— but signing onto a lopsided agreement which will only benefit the owners of resource enclaves is another thing entirely and should be reconsidered.